Two books in one jacket. Hot-Spot reminder and past and future month calendar reference on each page. 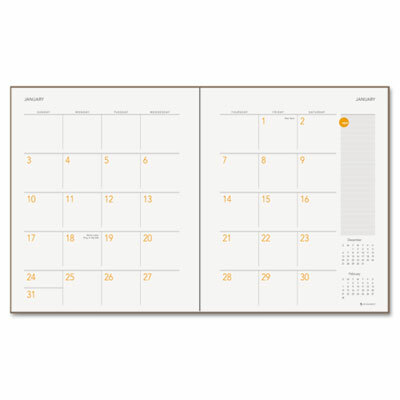 Special pages include: three-year reference calendar, holiday, future planning and contact pages. Planning notebook has 160 lined, perforated pages with date area at the top of each page. Actual tear-out page size: 8-1/2 x 11. Two books in one jacket. One month per two page spread. Hot-Spot reminder section and past and future month calendar reference on each page. Special pages include: three-year reference calendar, holiday, future planning and contact pages. Planning notebook includes 160 lined planning pages. Perforated pages with date area at the top of each page. Actual tear-out page size: 8-1/2 x 11.